Second Workshop, Toronto 14/15 September 2018. Friday September 14, Flavelle Hall, Room 219 (Willis Classroom, Donegan Conference Centre, UofT). 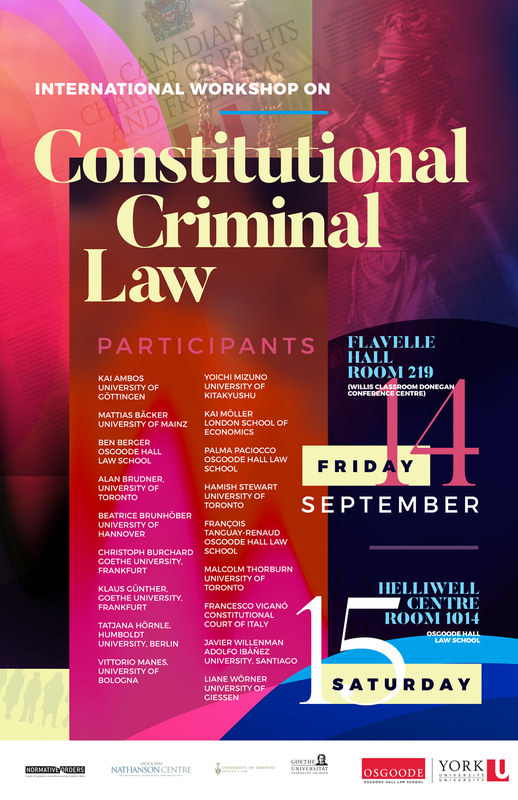 Saturday September 15, Helliwell Centre, Room 1014, Osgoode Hall Law School, York University. First, in the many ways in which criminal law and criminal justice are constrained by general conditions on the legitimate exercise of public power. A number of putatively criminal law doctrines (such as the presumption of innocence, the fault principle, the conduct requirement, and others) can be understood not merely as criminal law doctrines but as incidents of a certain conception of legitimate public power. Also, the rise of the administrative state has meant that a certain conception of the rule of law has had important implications on our understanding of many aspects of criminal law and criminal justice. As criminal law and criminal justice have changed significantly in recent years, we aim to understand how these changes might affect the legitimacy of the exercise of public power in these areas.